Hypochlorous Acid (HCIO) is a weak, unstable acid occurring only in solution and used as a bleach, oxidizer, deodorant, and disinfectant. It has strong antimicrobial and antibacterial properties. It is often used as a safe disinfectant to treat water supplies, irrigation systems, and food preparation surfaces. Hypochlorus acid is also used to sanitize water used in hydroponic growing systems. Hypochlorous Acid cannot be isolated from these solutions due to rapid equilibration with its precursor. Sodium hypochlorite (NaClO) and calcium hypochlorite (Ca(ClO)2), are bleaches, deodorants, and disinfectants. 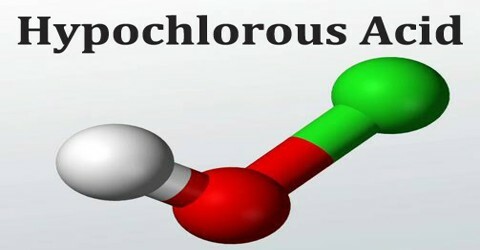 Hypochlorous acid only exists as an aqueous solution. It is a colorless solution, and its exact physical properties are variable, since they depend on how concentrated the solution is. Anhydrous or dry hypochlorous acid is impossible to prepare since the molecule exists in equilibrium with its anhydride. It is produced in the human body by the immune cells to fight infections, as it acts against a wide range of microorganisms. It is a strong oxidizer and can form explosive mixtures. 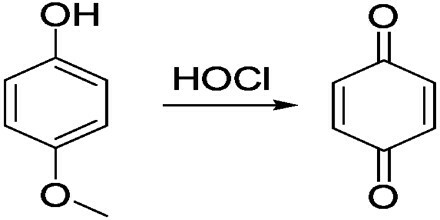 In aqueous solutions, being a weak acid, it partially dissociates into the hypochlorite ion (OCl-) and H+. 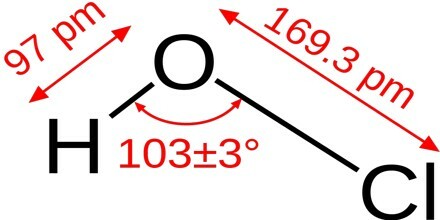 The chemical formula of hypochlorous acid is HOCl. Its molecular formula is written as HClO and its molar mass is 52.46 g/mol. It is a simple molecule with the central oxygen connected to chlorine and hydrogen atoms through single bonds. The formation of stable hypochlorite bleaches is facilitated by dissolving chlorine gas into basic water solutions, such as sodium hydroxide. The acid can also be prepared by dissolving dichlorine monoxide in water; under standard aqueous conditions, anhydrous hypochlorous acid is impossible to prepare due to the readily reversible equilibrium between it. Hypochlorous Acid (HOIC) is a more powerful oxidizer than chlorine and a very effective sanitizing agent. It is used to make sodium hypochlorite (NaOCl) and calcium hypochlorite, (Ca(OCl)2), which are used in the making of bleaches, disinfectants and deodorants. 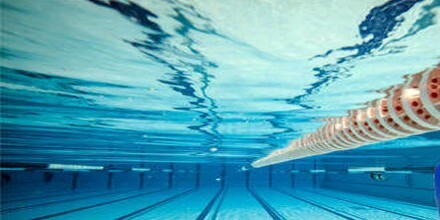 Hypochlorous acid is the active sanitizer used in swimming pools. It is also used as a wound disinfecting agent, and a skin cleansing agent in cosmetics. Not only is it used to disinfect surfaces that may come into contact with food, it can be used in maintaining gardening equipment. Additionally, hypochlorus acid can be used to treat water ran through hydroponic systems. Reference: dictionary.com, softschools.com, maximumyield.com, wikipedia.